Picking the right windows for your new conversion is possibly the single most important aspect of your design and will make or break your project. The location and style of the staircase will impact on the interior aspects of the house as a whole but, in the actual roof space, the window will be the focus point of your new room and can, and should, be the one factor which underpins the whole design. The choice of loft windows is now truly astonishing and the industry has made incredible strides over the last decade to the point that the right choice of loft window can make an ordinary conversion look absolutely spectacular. Whereas loft conversions used to be trademarked by very small windows the modern homeowner has the choice of large suntraps, electrically operated and even remotely controlled loft windows, glazing options, choices of different styles of opening and even balcony and roof terrace systems. By following the highlighted links on this page you can investigate every type and style of loft window available which are all variations of either dormer windows or the flush fitting traditional roof window or roof light. Dormers are usually used to help create extra light and space with the modern style flat roof type providing up to 30% more interior roof space. An alternative to the flat roof dormer, which often looks unseemly and box-like, is the more elegant gable dormer, otherwise known as chocolate box designs. Chocolate box dormers obviously look nicer and certainly suit older houses much better than a flat roof dormer, but they are much more expensive and don’t create as much room as their less attractive, but more practical, brother. 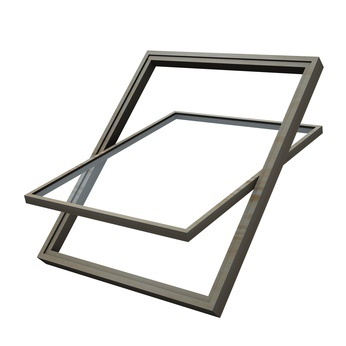 Still the most popular window option is the traditional skylight windows. Fitting flush to the roof they are very quick and easy to fit and, in their basic versions, very much cheaper than dormers but of course don't allow the extra headroom that dormers provide. The best known make of roof light is Velux and some of the products now marketed by this well-known company are amazing. And, before going further, it should be noted that Velux windows, though often used to describe roof lights is actually a brand name which, like Tarmac and Hoover, has become so famous that people use the brand name to describe the product. 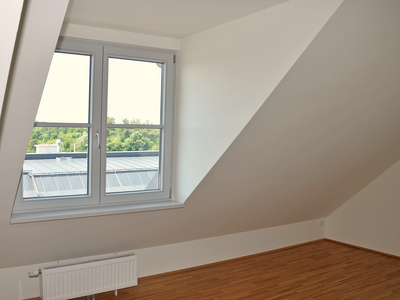 But, the choices that the homeowner now has when he/she comes to pick their loft windows is huge, and is not simply limited to Velux windows. If the loft conversion can be built without a dormer, roof lights can be added very quickly and cheaply to provide natural light and, of course, there is no reason why multiple loft windows cannot be installed. Indeed, the effects of a bank of four roof lights arranged side-by-side, can be spectacular. The final choice of roof light will very much depend on the design of your loft conversion but there are a number of options to consider. First thing to decide is the style of opening. 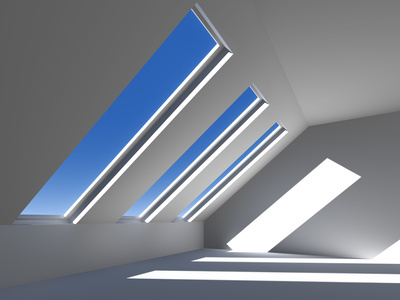 Roof lights are usually centrally pivoted but, for escape windows, they are more often top hung. A big advantage of a centrally pivoted roof light is that they save a lot of space as furniture can be placed directly beneath them without creating access problems. Another point in their favour is that they are easily cleaned and maintained from inside the loft conversion – an important factor when they provide a focal point of a room. The top hung style is ideal for low pitched roofs as they open outwards and, for this reason, are also best suited as escape windows. 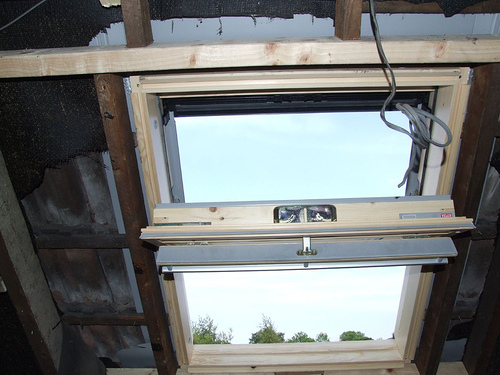 Note – if a roof light is to be used as an escape window then, according to the building regulations, it must have a clear opening sufficient for an adult to get through and it must be located in a position where it is possible for it to be reached by a rescue ladder. For this reason escape windows are usually sited on the front elevation of the house. For more information on loft conversion safety click here. Your choice of loft conversion design will also play a part in deciding which finish should be applied to your loft windows. Timber framed units are usually the most stylish and practical solution but, for bathrooms and perhaps children’s bedrooms or playrooms, it may be advisable to select the more practical and maintenance free polyurethane loft windows. Windows can be glazed to your preference including double glazed and, for use in bathrooms, obscured glass. And, innovations over recent years means that homeowners can now opt for electrically or even remotely controlled roof lights. Obviously these are more expensive than their manually operated comrades but they do add that last stylish touch of luxury to your loft conversion. Once their design is decided upon roof lights are very easily installed and, for a builder or diy expert, should only take a few hours to fit. One final point is to ensure that the appearance of your roof lights are not spoilt by poor flashing. The material should blend into your roof and provide a watertight seal. Taking the time to plan your loft conversion using roof lights or dormers to their best advantage can transform your project, and the right design will not only be bathed in natural light but can also be visually striking. The panoramic views offered can add a whole new dimension to the room you are planning and, for bedrooms and living rooms especially, provide a luxurious new living experience for the homeowner.